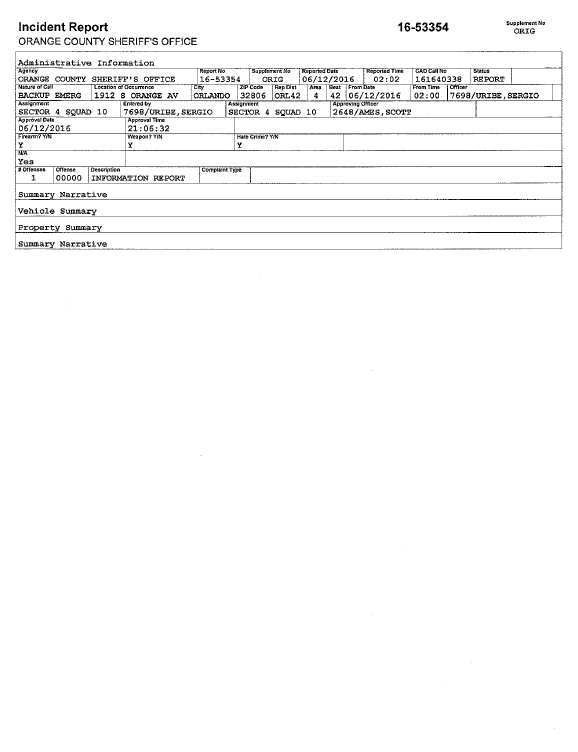 The following incident report was released by the Orange County Sheriff's Office on June 25, 2016. 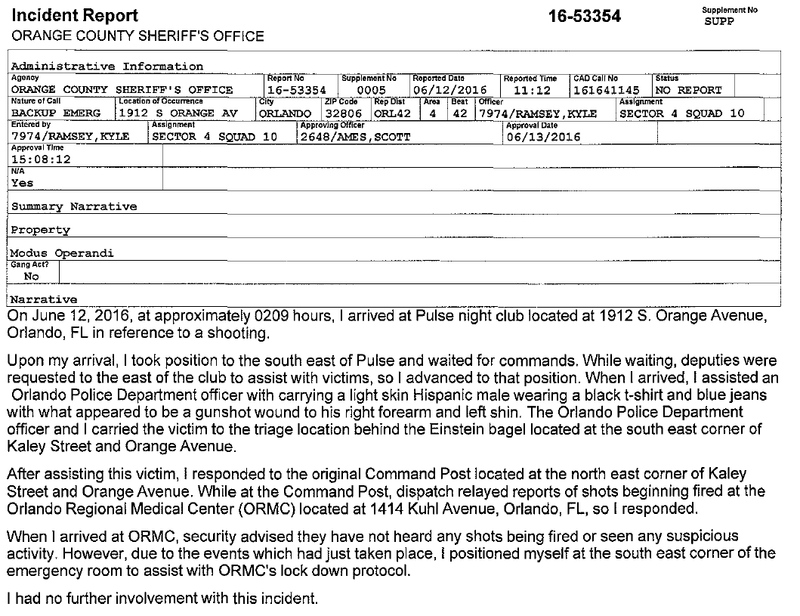 On 06/12/2016 at 0211 hours, I responded to the area of Kaley Avenue and Orange Avenue in reference to an active shooter at “Pulse” nightclub. Upon arrival, I observed numerous subjects running from the club in a panic. I observed several subjects lying on the ground near the club that appeared to have been injured by gunfire. Fearing the shooter to still be inside, I made contact with several Orlando Police Department officers and walked toward the northwest corner of the club. I then took a defensive position with these officers and maintained visual contact with an open doorway on the west side of the club. I maintained this position until I was relieved by SWAT personnel. I then assisted with traffic control at the intersection of Orange Avenue and Grant Street. On June 12, 2016 I D/S James Baggs responded to 1912 South Orange Avenue 1n reference to signal 43 (emergency back-up) called by Orlando Police Department with shots fired. Upon arriving on scene I provided cover for Officers and Deputies who were extracting victims out of the East side of the building. I then took an inner perimeter spot on the Northeast corner of the building and covered an open door on the North side. Upon Orlando Police Department SWAT engaging the suspect, I ran to the South side of the building and assisted victims who were exiting the building. I had no further involvement in this incident.